Karen Litfin is associate professor of political science at the University of Washington. "In lively, honest and reflective prose, Litfin offers deep insight into how this research project has been part of her own mission of living more sustainably. While Litfin provides us with a range of practical information about the principles of ecovillage organising  including countless nuggets of inspiration that will be useful to anyone, not just those intending to live in communities  she also puts forward a theoretical framework for analysing these emerging ways of sustainable living." "If you can't take a year off to visit ecovillages around the world, this marvel of a book is the next best thing. Its actually even better for the carbon it saves, the questions it asks, and the wisdom it shares. Karen Litfins journey enlivens our understanding of the Great Turning. I am eager to share it with all my students and fellow teachers." "This book offers a unique opportunity to compare several different forms of sustainable communities around the world, giving us a glimpse of the best practices and challenges of the global ecovillage movement." 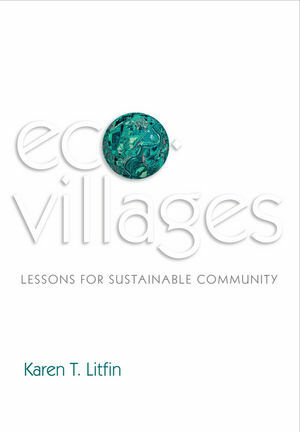 "In these times of political gridlock and myopia, Karen Litfin's tremendously engaging and informative exploration of eco-villages around the world points the way to a viable and attractive future very different from the bleak place to which we are now headed. You will enjoy this book!" "Ecovillages offers that rarest of gifts: wisdom. It asks not simply how to address the build-up of carbon, dwindling of species, and toxification of our world, but how we can live together joyously on a single earth. Among the book's many beauties is that it is written from the wellspring of experience and expressed through Litfins hands, voice, and soul." "The world is in for a major transition, a huge downshift, ready or not. For those inclined to roll up their sleeves and get ready (as opposed to lament the trends and decry business as usual), ecovillages can offer insight and hope. As Litfin shows in this compelling book, they exemplify an 'affirmative politics,' a politics at once ecological, economic, community-oriented and spiritual. Ecovillages arent for everyone, but in these uncertain times, their lessons may be." "Karen Litfin is a perceptive, thoughtful, and gifted observer of the human predicament. In writing Ecovillages, Litfin combines her intellectual prowess with her sensitivity and compassion to tell a hugely important and inspiring story." "Karen Litfin has not only written a book of great importance to all of us at this pivotal moment in history, she has also done it in a way that is lively, moving, informative and compelling. This first-rate book deserves to reach the widest possible audience; we must pay attention to it if we are going to thrive as a species on this fragile planet." "Ecovillages have for many years acted as micro-laboratories for building a low carbon, post-growth society. But what can we learn from them? How much of ecovillage life is scaleable and replicable? Karen Litfin set out to find out, and her learnings and insights are invaluable. We owe her road trip and her research a great deal, there is much wisdom and treasure here!" "An inspiring and instructive journey to the wide range of communities pioneering a sustainable global future." "Nature teaches us that nothing disappears when it dies, it merely becomes something new. Karen Litfin's lucid and heartfelt book reveals the new life emerging in the cracks of failing systems. Through her eyes, we meet people everywhere who are building high-joy, low-impact communities. Litfin is the perfect guide: intellectually rigorous, spiritually awake and deeply caring. If you want to create a richer, gentler life for yourself and your community, read this book!" Karen Litfin understands that today we need inspiration as much as information, to forge the vibrant communities that will carry us into an enduring future. The success stories she brings to life are just what we need to revivify our existing communities on a planet perched at the precipice. "One of the most powerful questions asked of us by our world crisis is, 'How can we live together in ways that allow us to "be the change" together?' Karen Litfin's book gives us answers. These ecovillage experiments  idealistic, imperfect, courageous, creative and honestly described - will help us transform our consciousness and find our way forward."